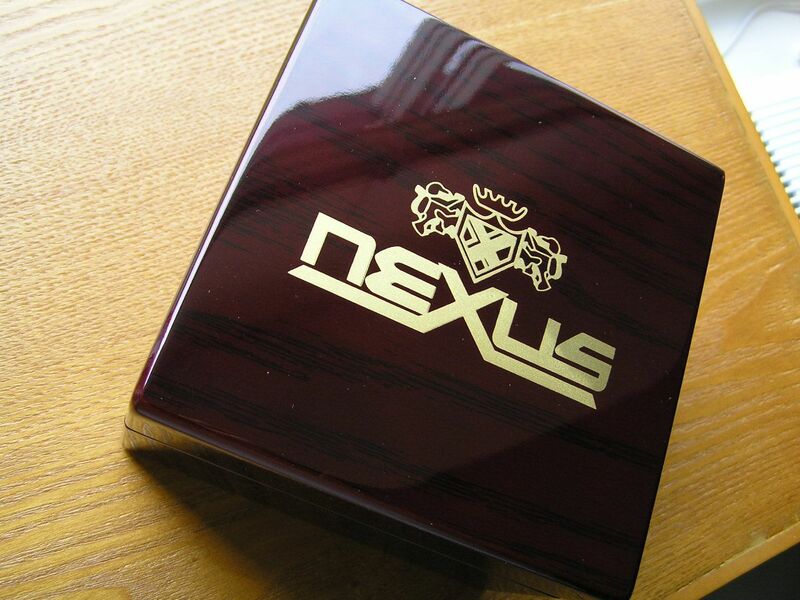 In my intrepid quest to get the most value for my money, I took the plunge on this Nexus chrono last year. Don’t really know too much about Nexus, they seem to have popped up suddenly a year ago and seem to have disappeared just as quickly, too. It seems they were a ‘mushroom’ brand out of China for several months. 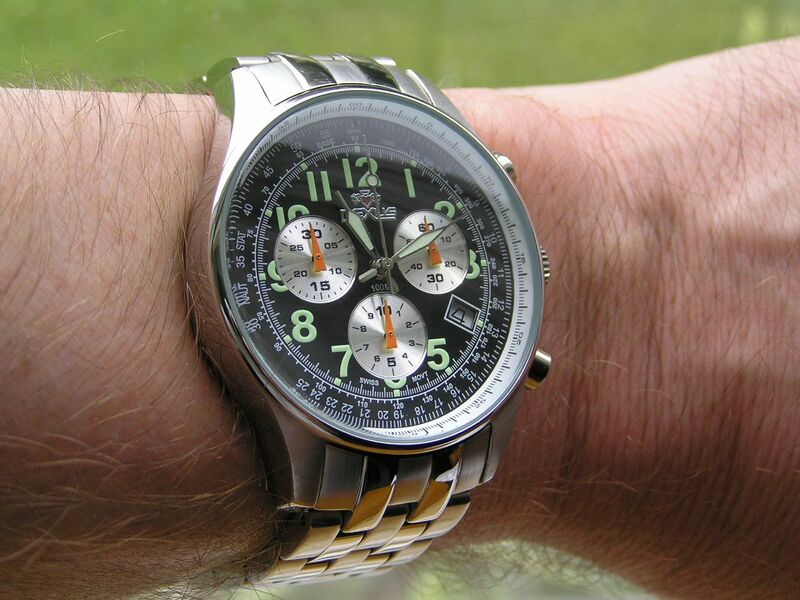 Most of their designs are too gaudy for me, gold pieces that try to look like Rolex, but this one, although somewhat derivative of a Breitling Navimeter, caught my eye. For the price, I couldn’t pass it up. What did I get for my money? 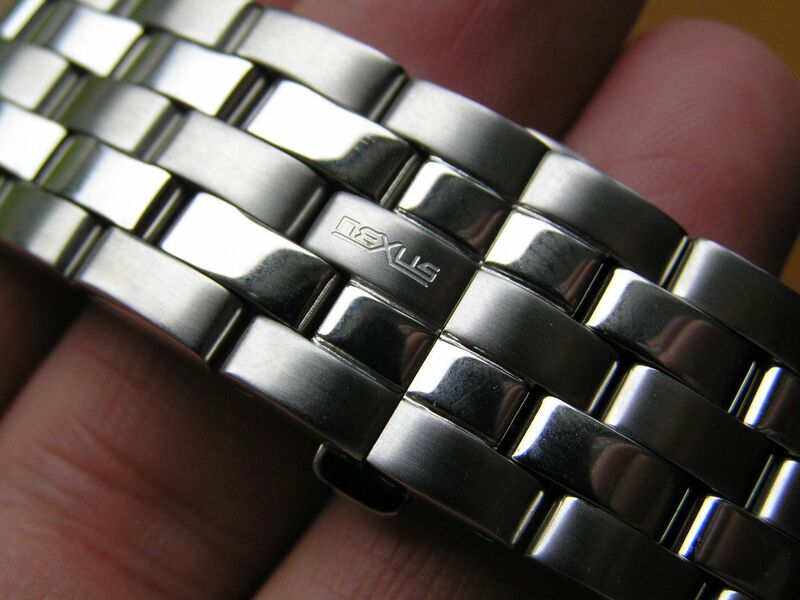 This Nexus starts with a nicely finished all stainless steel case that is polished and brushed, with a polished screw down case back. The crown is signed and screws down, although the screw down feel could be a bit better, it’s a bit rough. 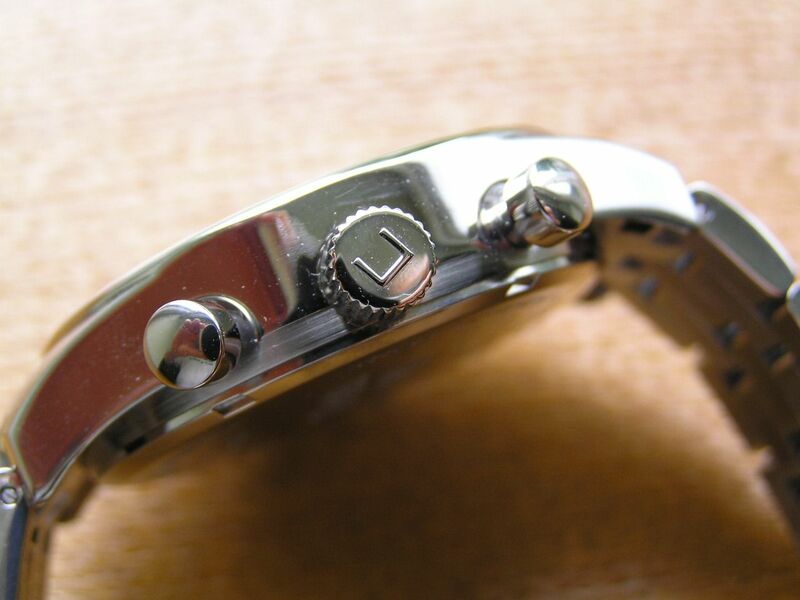 Case measures 40mm w/o the crown, 12.5mm thick, with 20mm lugs. The crystal is a domed mineral with no anti-reflective coating. 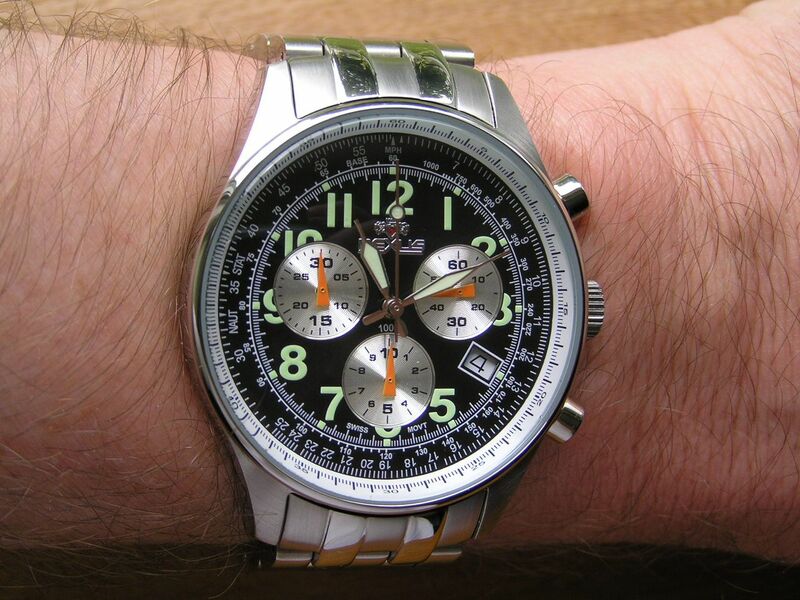 I love the retro-style chrono pushers. Watch is rated at 100 meters water resistance. Inside this watch beats a Ronda 5040D quartz chrono movement that measures in tenths of seconds up to 30 minutes, then in seconds up to 10 hours. The date is a quickset @ 4. Ronda has two flavors of this movement, a 6-jewel, nickel ‘Swiss Parts’ assembled in Thailand and a 13-jewel gold gilt all-Swiss made in Switzerland. My guess is it has the lesser movement in it, but I haven’t cracked the back to check. Either way, I like the movement and over ten days time, it’s running one-half second fast. Completely acceptable! 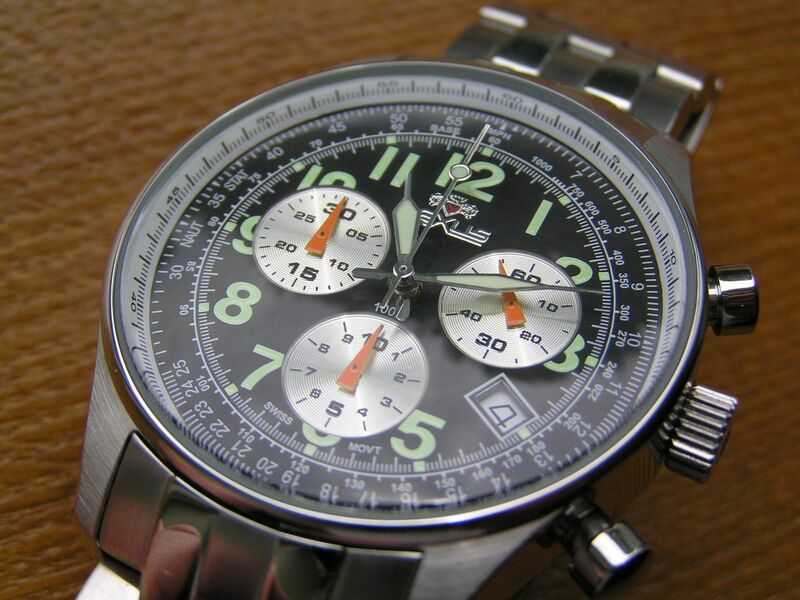 The dial is black with silver chrono subdials that have nifty orange hands. 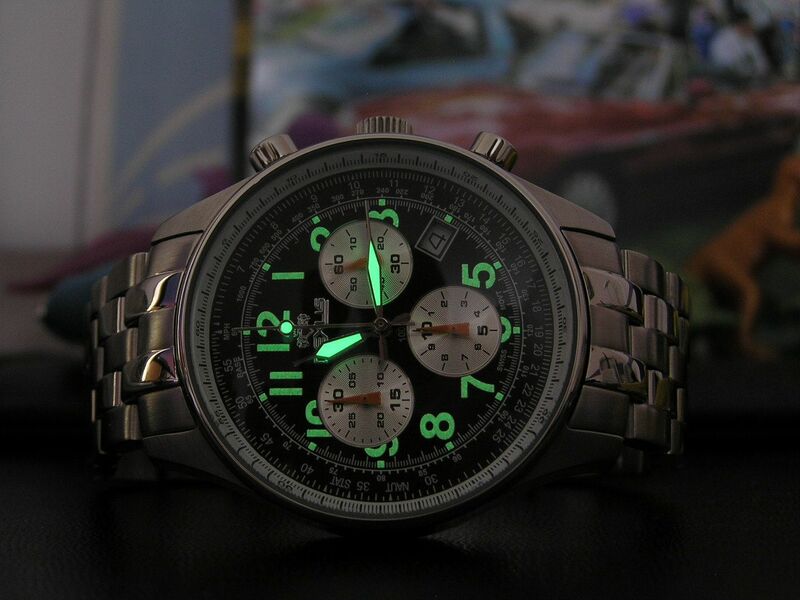 The arabics are green lume. 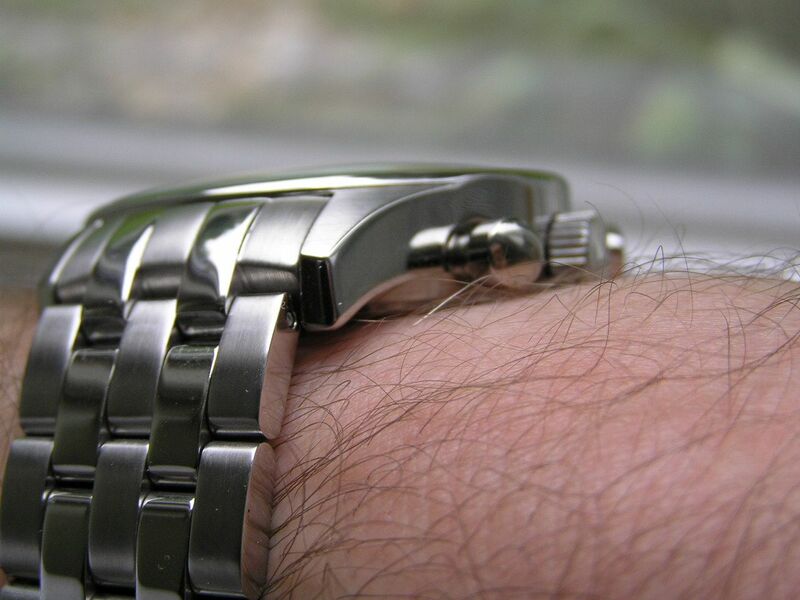 The hands and chrono ‘meatball’ second hand tip are also luminous. The lume is surprisingly good. I like the style of the hour and minute hands with their pointer tips, but they can be hard to see at times against what is a fairly busy dial. I had considered installing different main hands but couldn’t find anything that I felt would look right with this dial, so I decided to just live with the stock hands. So far, so good. The bracelet is a solid link continuous design, with solid end links and a pushbutton butterfly clasp. The bracelet is signed near the clasp (a classy touch!) and the deployant is polished and finely finished. I usually don’t like this style of bracelet because I can never seem to get a good fit (either too tight or too loose) due to the lack of a fine adjustment on the clasp, but I lucked out on this one and achieved a perfect fit. 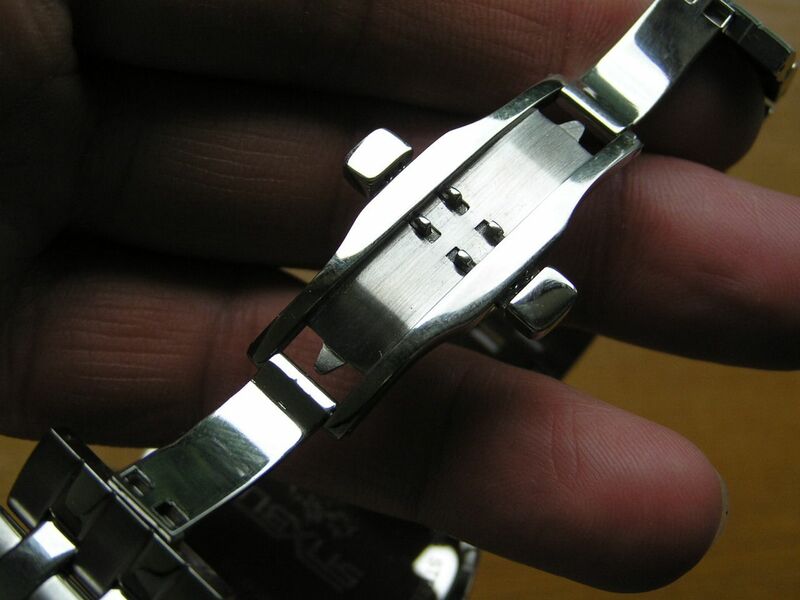 The links are polished and brushed and the fit of the end links against the case is very good. The presentation of this watch blew me away. The lacquered box (I believe it’s all plastic made to look like wood) is nicer than the box that my Oris came in. The box is big, solid and very impressive. 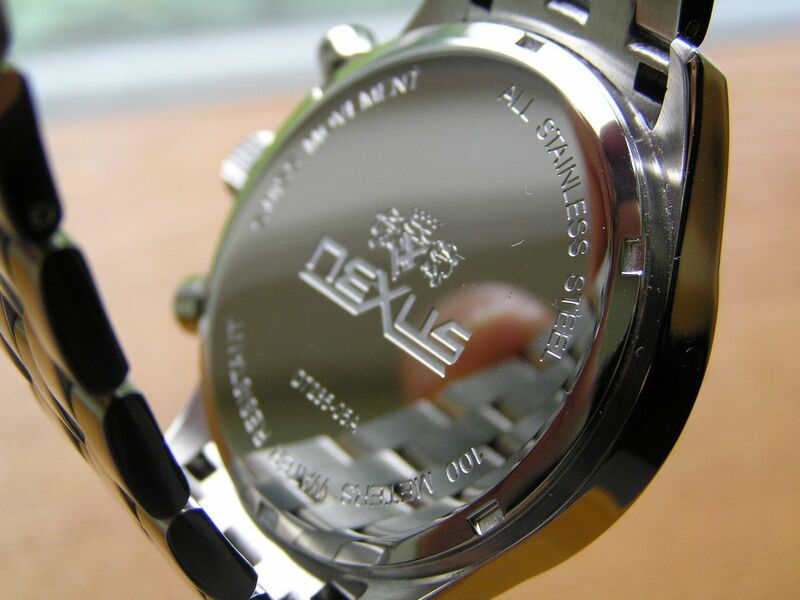 Kudos to Nexus for presenting this watch in a classy way! 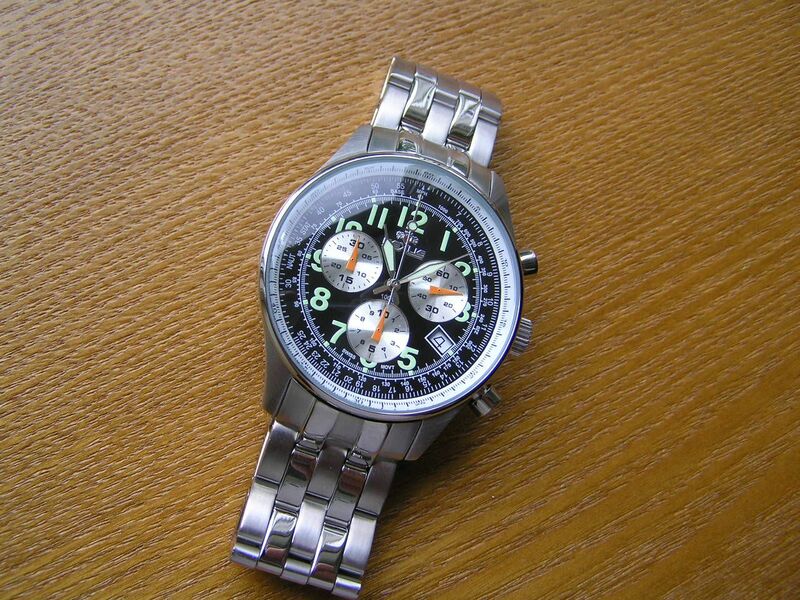 This watch has a fantasy retail price of $450 or so, they usually sell for $150 or less on the street. If you can get it for $75 or less, you’ve done well. 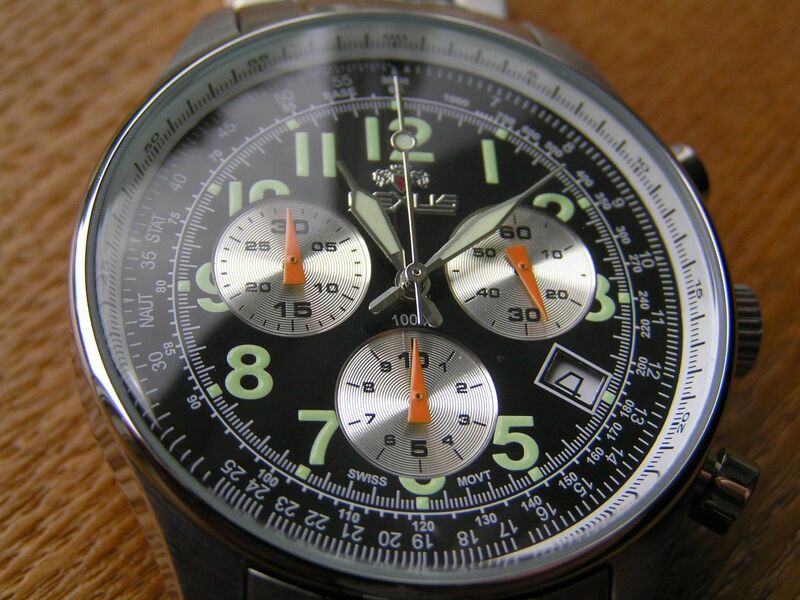 This model comes in a few different dial colors, I like the black dial I bought the best. 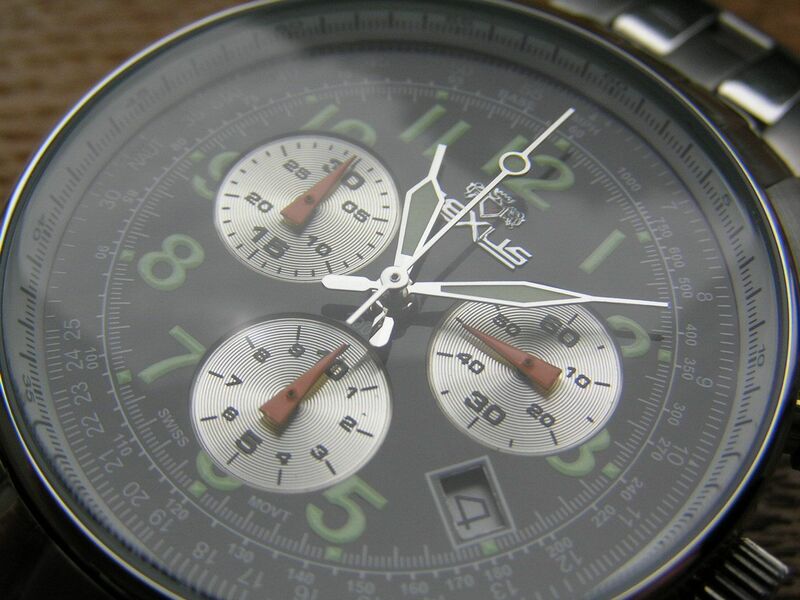 Overall, Nexus has a nifty little watch here that holds its own against anything from Invicta or some other popular brands (Croton, Wenger, etc.) at this price. 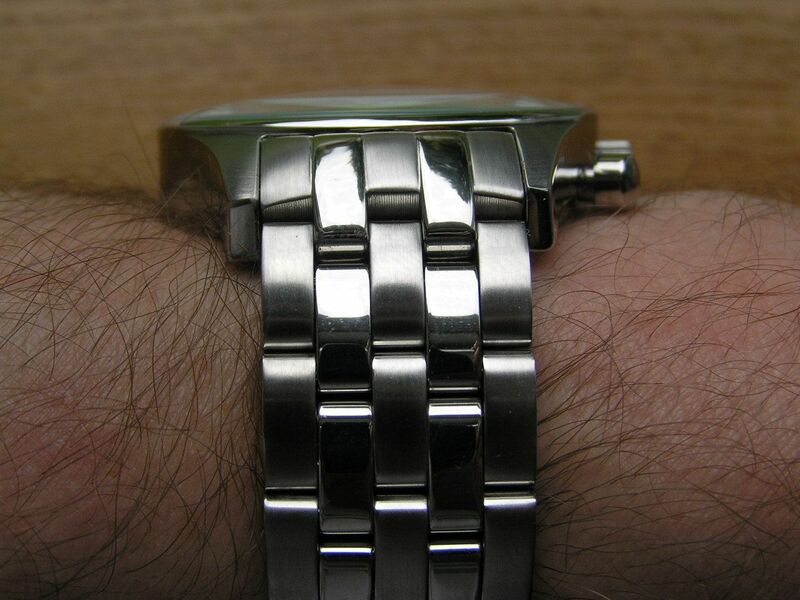 I sold this watch a few months after I purchased it. The hands were just a bit too hard for me to read, although, as I have stated, for the price, it was an impressive little piece. I bought a yellow faced one of these today. Do you have an idea of where to get a manual for this? You can do a Google search but that might not yield much. 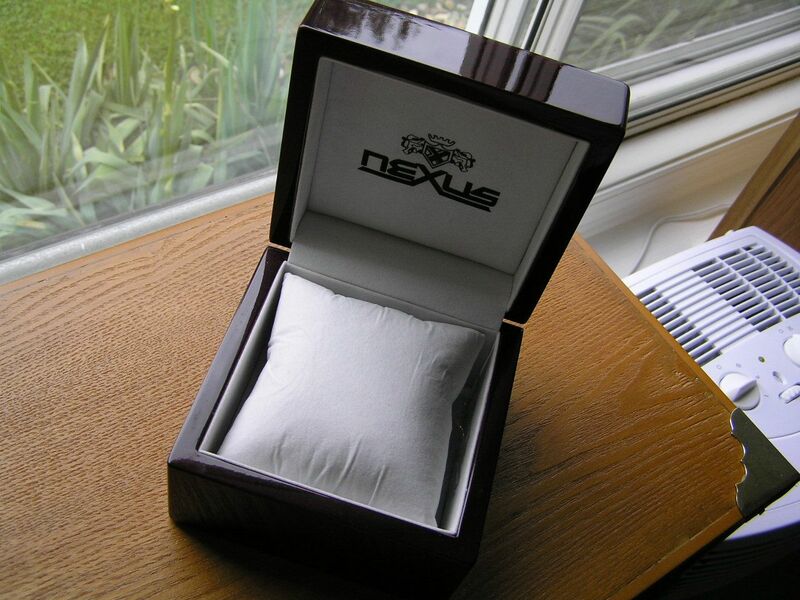 Nexus was a 'pop up' brand that was made for about six months and then discontinued. If you know what brand of movement is inside, you can look up instructions from the movement manufacturer. Many of the companies like ETA, Rhonda, etc. have instructions or at least specs. on line for their products.